Jug, Staffordshire, England, ca. 1850, Chipstone Foundation Collection. Photo by Gavin Ashworth. Among the Chipstone Foundation’s fine collection of early English pottery stands an startlingly oversized curiosity: what appears to be a 30-inch ironstone tall milk jug, or pitcher. Adorned with rich copper lustre ornamentation and hand-painted flowers, this monumentally scaled object also features an unusual inscription that gives some insights into the jug’s origins. The gilt lettering reads, “Presented by Alfred Meakin, Tunstall England to Sohn, Ricker and Weisenhom Quincy Ills U.S.A.” Who exactly are these people? And how did this huge jug make its way to the U.S. from England? Read on to find out. Alfred Meakin was born into a family of potters in England. His father, James Meakin, was part of the Newtown Works in Longton, while his brothers James and George Meakin founded the pottery J & G Meakin in Hanley. 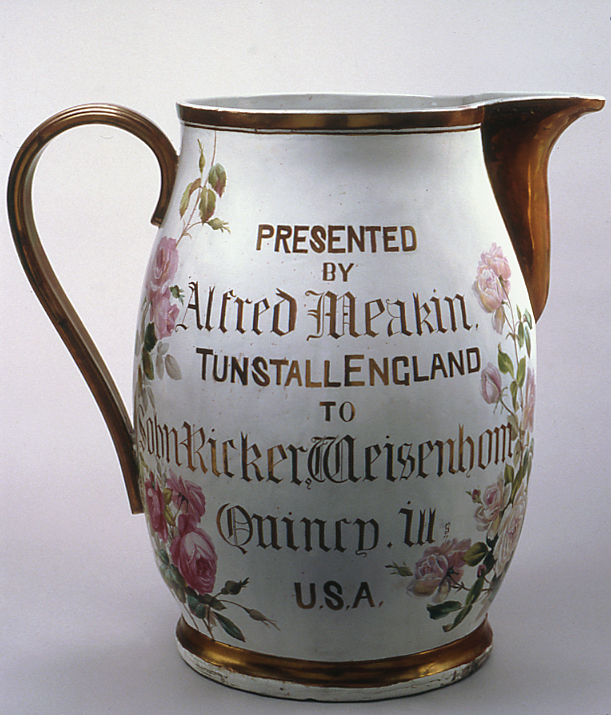 Alfred soon followed in their footsteps, starting the Alfred Meakin pottery in 1874 at Tunstall. His pottery was an amalgamation of three different factories: the Royal Albert Pottery, Victoria Pottery, and Highgate Potteries. These factories manufactured ironstone china and white granite wears, which were widely exported and distributed to shops in the United States, and also sold through the mail-order catalogues of prominent American retailers. Meakin is perhaps best known, however, for being one of the most prolific manufacturers of “Tea Leaf”-decorated china wares, which were immensely popular in 1850’s America. 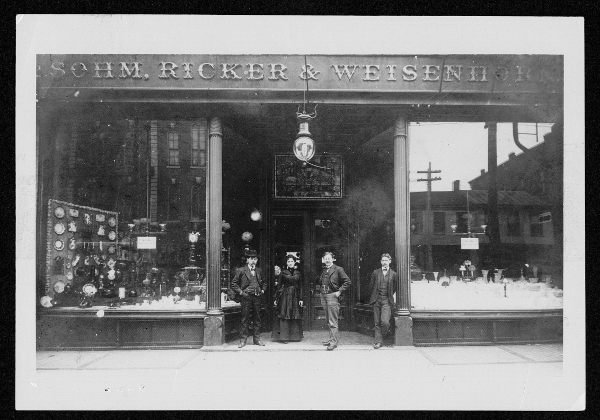 Meanwhile, in Quincy, Illinois, three men–Edward Sohm, William Weisenhorn, and Bernard Ricker–were partners in a china shop from 1884 through 1913. At the time, Quincy was a bustling city thanks to its proximity to the Mississippi River, which was the primary conduit for the dissemination of trade goods from Minnesota down to Louisiana. Quincy grew rapidly as a market center for counties in Missouri and Illinois. By 1870, Quincy surpassed Peoria as the second largest city in Illinois, and the processing and trade of valuable agricultural and mineral resources grew steadily thereafter. Increased wealth and greater access to imported goods whetted the appetite of local residents for stylish domestic wares, including fine pottery and exotic china. It was in this rich environment that Sohm, Ricker & Weisenhorn operated their china, glass and queensware store. The firm did well in its time: “The amount of business transacted by this firm during the second year of its existence was 33 1/3 per cent in excess of that done the first year,” reads a report. 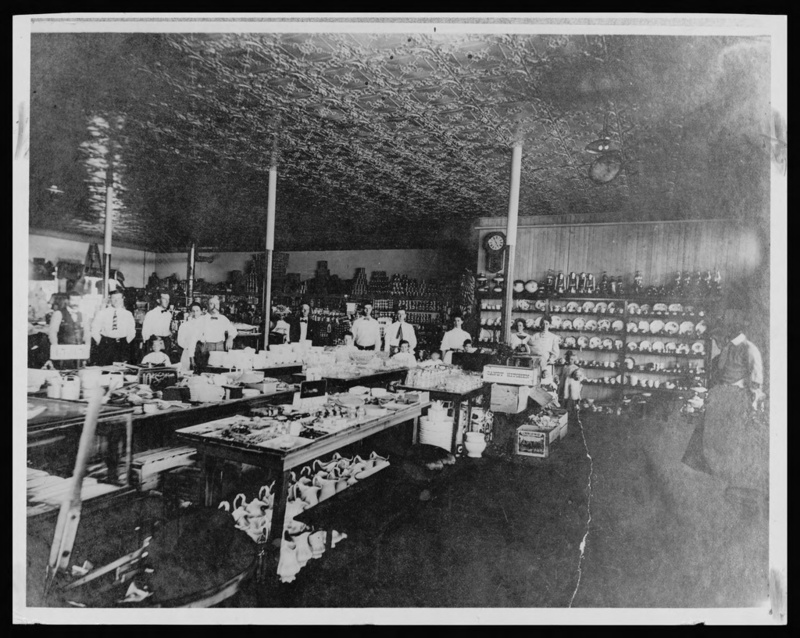 “A similar increase was attained in 1886 and 1887, while during the following year the firm did the largest queensware business ever done in the city of Quincy by a single firm in the same length of time.” The scale of their operation is reflected in the successful operation of a four-story store that was 120 feet deep by 20 feet long; they even owned two huge inventory storage warehouses. To bring our stories together, one of the lines of pottery that Sohm, Ricker & Weisenhorn carried and sold was–you guessed it–Alfred Meakin’s. It is speculated that Meakin awarded Sohm, Ricker & Weisenhorn this very large presentation jug as a reward for selling large quantities of his wares. The Sohm, Ricker & Weisenhorn presentation jug is not the only oversized presentation piece that Meakin produced. Around the turn of the century Alfred Meakin’s pottery produced what was then proclaimed to be “The World’s Largest Teapot,” according to the Stoke-on-Trent Museums. This legendary teapot held 20 gallons and weighed 250 pounds. It was once owned by George Pritchard of Rome, New York, but now the fate of the object is unknown. The Quincy presentation jug falls into the storied, oversize jug tradition. Although the reason for the gift is not stated on the jug, as it is on the Krenning teapot, we can guess that the success of the firm was the reason for this odd and interesting vessel’s creation. Still, some questions remain. Where was this jug displayed? Was it thought of as a modern day trophy, albeit a more distinctive one? Was it a curiosity that drove more customers into the shop? Did it serve as promotional material for Alfred Meakin–an advertisement of sorts? Were there yet more oversize Meakin vessels along the Mississippi? If you’d like to see this jug for yourself, get in touch with Chipstone. Since exhibitions are always changing at art museums, the presentation jug moved in the past year from its location next to the Chair Park at the Milwaukee Art Museum to the Chipstone Foundation Museum at Fox Point. The Chipstone Foundation museum in Fox Point is open by appointment. This entry was posted in Art, Curatorial and tagged Chipstone Foundation, Jug, pottery, presentation jug. Bookmark the permalink.